Kalamazoo WaterJet is Proud to be Part of ABC TV’s Battlebots! 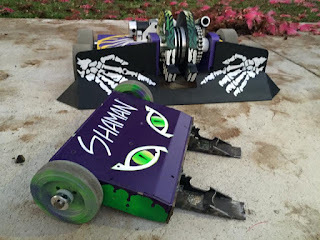 Until you see these robots in action you can’t imagine what this is all about, but check out this Youtube video of last year’s battle between Witch Doctor and Tombstone and you’ll get the idea: https://www.youtube.com/watch?v=m4AAIfQD8ew . According to Bryan, all robots were redesigned and are generally tougher and proved to be more aggressive, especially Witch Doctor. Each entry has a weight limit and if there is an accompanying smaller robot or drone with the main entry, the total weight of the two cannot exceed 250 pounds. Witch Doctor has a little buddy, named Shaman, and there are flying drones with other entries. The drones are new for this year. The show is ten episodes and you’ll find that it’s somewhat addicting to see how the different designs and structures hold up against each other. “These folks are all nuts, but in a good way!,” says Bryan. Through Bryan’s efforts Kalamazoo’s own Schupan and Sons and Good Metals Company of Grand Rapid are also a Witch Doctor sponsors, making Southwest Michigan well-represented at this amazing battleground. Bacon, High in the Sky! Well, as we say here at Consort, "What's Next?!" 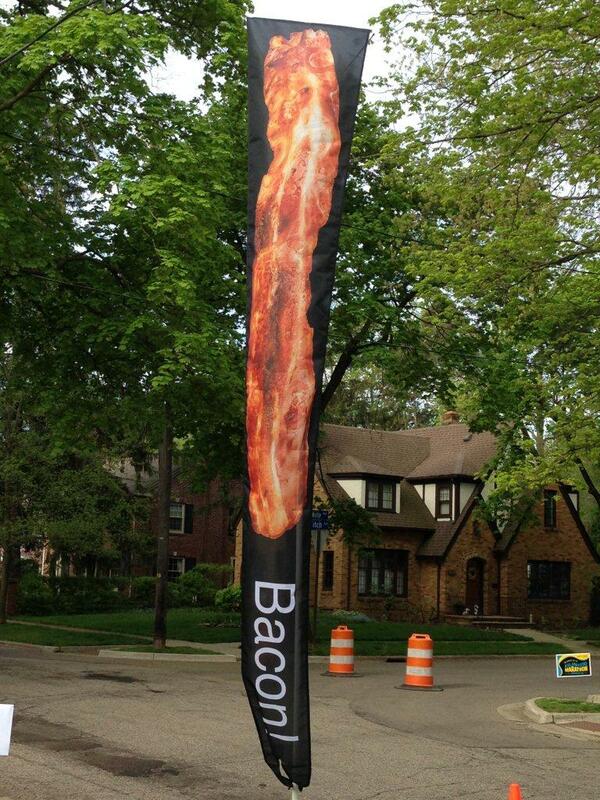 How about bacon images on your Dori Pole pennants? 'Bet you never thought of that! Yes, it's true, in Consort's home town of Kalamazoo, the annual 26.2 marathon has been a major community event near the first part of May for many years. 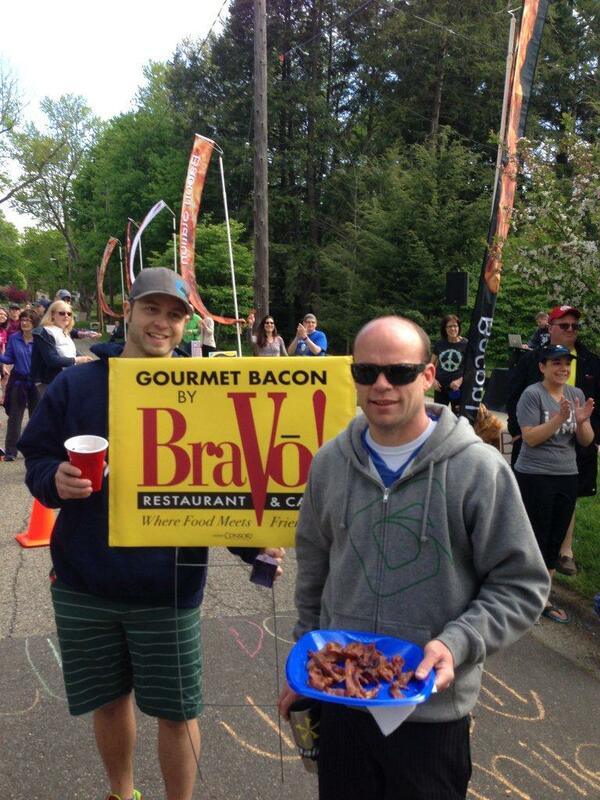 For the past four years the inspired and enthusiastic neighbors that live near the halfway point have sponsored what every creative marathon needs, a Bacon Station! With porcine delights of many forms the racers are enticed to drop their racer-motivated diets for just the opposite. Of course, most of the bacon and bacon muffins, cookies, fudge, and so on are eagerly consumed by the cheering spectators. 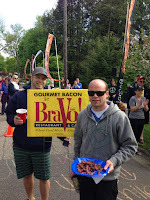 But, a surprising amount of the meat-candy is taken up by the racers,usually to be tossed aside 50 yards later where the neighborhood dogs have taken up their cheering section. Ruff! More! Ruff! More! A delightful time for all and the racers appreciate the attention and support, even if they aren't into the dubious nutrition being offered them. 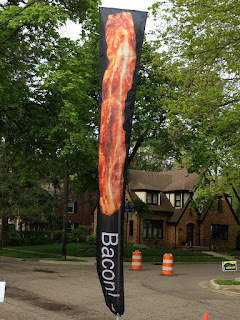 The bacon pennants are not a stock item in our array of available pennants, but if you're interested in those or have an idea for a specialty pennant design, contact your Consort sales rep today. Consort's Abstracta Shares Silver Award at GlobalShop 2015! With the recent “Silver Award’ from the juried competition during the 2015 GlobalShop Show, our Abstracta Modular Display System is once again recognized as a world player! GlobalShop, the world's largest trade show for retail design and shopper marketing, is held in Las Vegas each March. 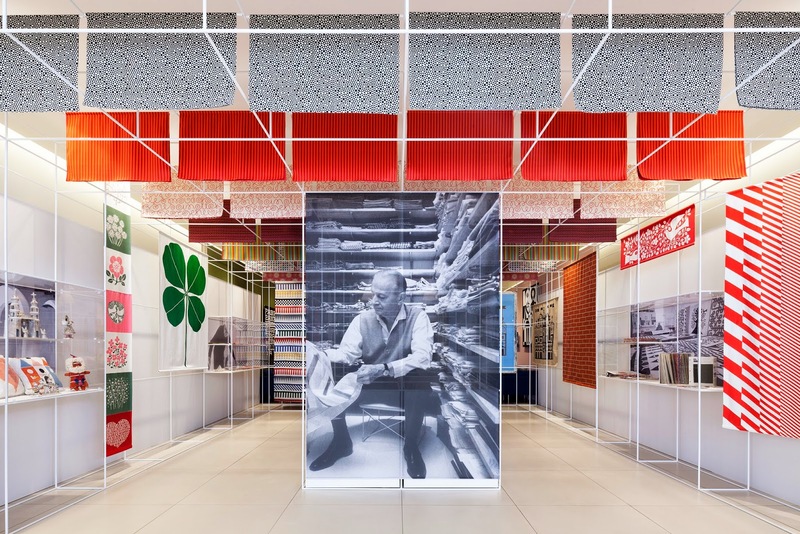 The competition has become a much-anticipated event for showcasing outstanding recent retail-oriented projects around the world. 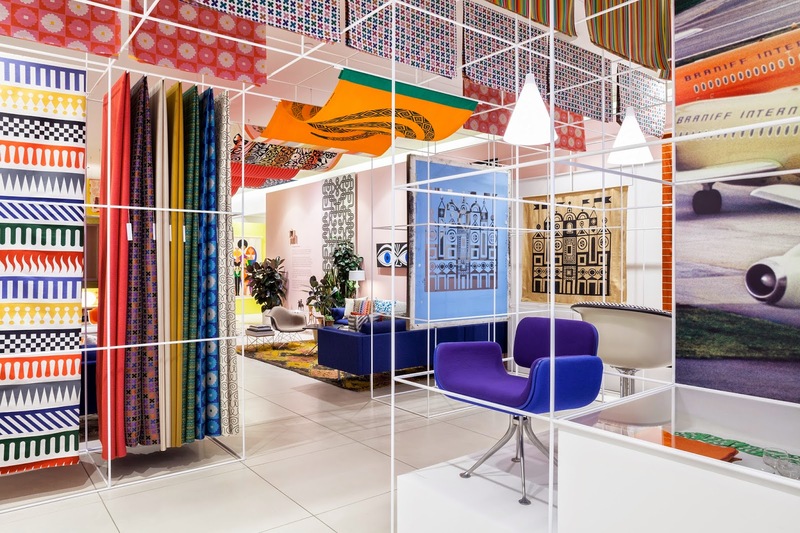 Our Abstracta system was the primary display medium for the Herman Miller “pop-up” store in New York City during May, 2014 where the large Michigan-based contract furniture company presented a striking, colorful and textural retrospective of Alexander Girard’s significant contribution to Herman Miller’s decades long success as an industry innovator. involving a 1,000 square foot portion of the company’s showroom at their massive showroom in Chicago’s Merchandise Mart in 2012. Abstracta was chosen for its simple and classic features that inherently take a back seat to displayed objects, such as Girard’s work, to be elegantly featured. It was the perfect choice for the incredibly eye-catching array of Girard’s brilliant work. Thank you Michael and Herman Miller for again choosing Abstracta! 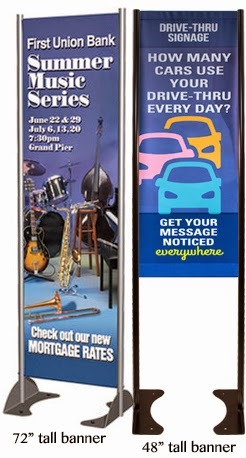 Outdoor Ground Mounted Banner Stand (GMS) Has a New Size Feature! 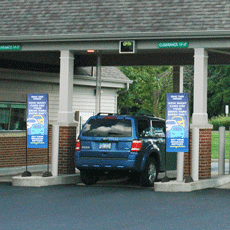 Our popular specialty banner stand, the Messenger® GMS, can provide important information about bank services. And now, banks have the option to alternate banner lengths from 48” to 72”, as they please. The new standard Messenger® GMS will accommodate either of those sizes simply by moving the bottom bar up or down. choosing Fifth Financial”. And, sometimes, we want to include more information about new services for example, along with images. Also, a 48” banner is a bit less expensive than a 72” banner. Of course, this new feature isn’t just for the financial industry. Shopping centers, automobile dealers and service stations, drive-through lanes for restaurants and many others can now take advantage of the new banner size option. By the way, the "GMS" stands for Ground Mount System and widths of stands can be ordered to fit 16", 18", 20", 22" or 24" banners. Thank you for your interest in Consort products! Please contact your sales representative for more information. Tabletop Beer Menus Help Patrons Make Quick, Informed, Beer Selections! Next time you visit a brewpup or bar, take a look at how they tell you about all the beers they offer. If they have to verbally recite the never ending list that numbs your brain or they point to some chalk board 15’ away, tell them they’re missing a super opportunity to make beer ordering simpler and quicker. specials? “What’s Olde Frothingslosh taste like?” “Is that a strong beer?” and so on. 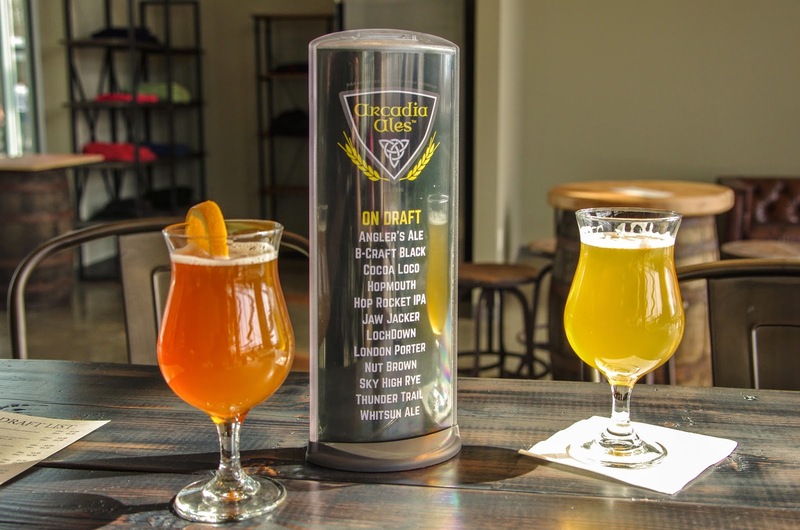 With Podia, the daily beer list can be printed and displayed in an a two-sided, unbreakable capsule to detail the type of beer, cost, alcohol percent and whatever information would help to have bar patrons make quick, informed decisions. What's more it's unbreakable! Check out the Demo videos HERE and see for yourself. Please tell your local brewpub about Podia. Consort Display Group. Simple theme. Powered by Blogger.